TOKYO---In a match that left something to be desired considering the hype, Risako KAWAI got the best of fellow Olympic champion Kaori ICHO. She’ll have to show tomorrow she can do it again for much higher stakes. Kawai defeated Icho in the highly anticipated clash between the titans of women’s wrestling, scoring a dull 2-1 victory in the opening match of their 57kg round-robin group at the All-Japan Championships in Tokyo. The two both then beat Sae NANJO, the third wrestler in their group, to advance to the semifinals. They both won, setting up an instant rematch on the final day of the four-day tournament that is also serving as the first stage in Japan’s qualifying process for the Tokyo 2020 Olympics. Kawai, coming off winning a second straight world title at Budapest in October and third overall, hardly outwrestled the four-time Olympic gold medalist per se; it’s more like she just did a better job of showing she was trying. The match had no technical points, as all scoring came with the opponent on the activity clock----Kawai had the fortune of seeing Icho flagged twice, despite the fact that Kawai herself initiated zero attacks. It’s one thing to play it safe against a four-time Olympic champion. But Kawai repeated that performance against world junior silver medalist Nanjo, winning by the same score, with the same points, and without a takedown attempt. Icho defeated Nanjo 6-2 in a much more active match. Kawai finally showed some life in the semifinals, where she used a takedown-ankle roll combination for a 4-0 win over world junior champion Hanako SAWA, while Icho advanced with a 3-0 victory over Akie HANAI. 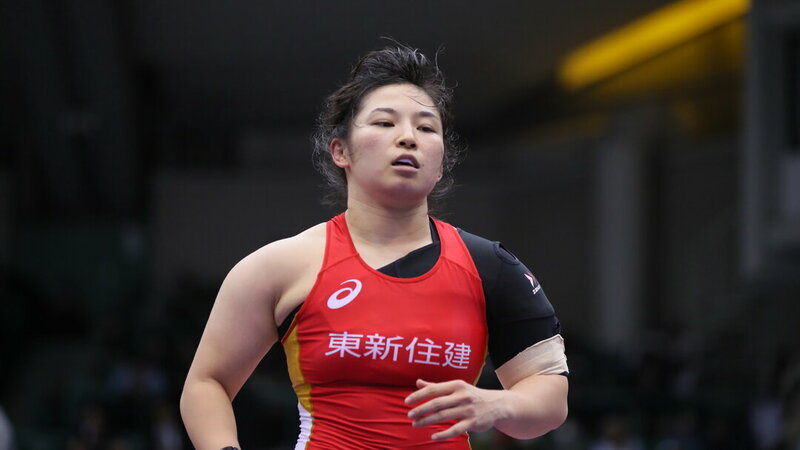 In the other match of global interest, Yuki IRIE repeated her victory from last spring over Rio 2016 champion Eri TOSAKA, winning 4-4 on big-point criteria to advance to the final of the women’s 50kg division, which had lost world champion Yui SUSAKI to an elbow injury. Irie twice followed giving up a point on the activity clock by scoring a takedown, when Tosaka scored a takedown with :15 left. But it wasn’t enough for the former world champion, who underwent foot surgery after the Rio Olympics. Tosaka will now need to win the All-Japan Invitational Championships in June to force a playoff with Irie for the ticket to the 2019 world championships, where winning a medal will earn an automatic berth on Japan’s team to the Tokyo 2020. 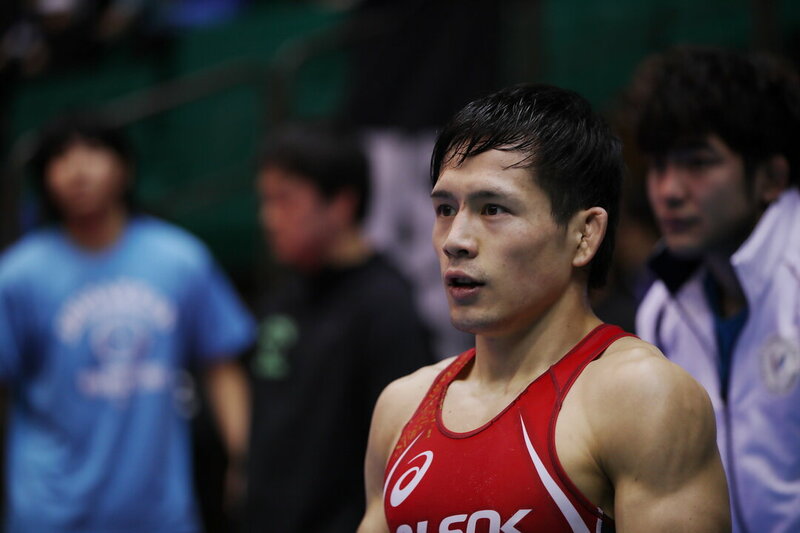 Meanwhile, Budapest 2018 bronze medalist Yuki TAKAHASHI barely came away with his third straight title at freestyle 57kg. Takahashi, the Paris 2017 world gold medalist, was trailing 4-4 on criteria when teenaged opponent Kaiki YAMAGUCHI, trying desperately to fend him off, was assessed a 1-point penalty with :02 left. An unsuccessful challenge left Takahashi the winner by a final score of 6-4. Takahashi was acquainted with Yamaguchi, having beaten him 4-0 in a tough semifinal battle last year when he was still in high school. “The fact that I could still win even without wrestling at my best gives me a confidence boost,” Takahashi said. On the heels of Susaki’s shocking withdrawal, the tournament lost another marquee match-up when women’s 53kg world champion Haruna OKUNO pulled out prior to her match due to a stomach virus. Okuno had been due for a clash with fellow world champion Mayu MUKAIDA, who dropped down from 55kg to the Olympic weight class. Had they met, it would have been only the 11thtime in Japan wrestling history that two reigning world champions faced each other in a domestic tournament. Mukaida launched her bid for a third straight national title---she won at 53kg in 2016---with a 12-2 technical fall victory over world junior champion Umi IMAI, then overcome a tough challenge from Momoka KADOYA, winning 3-0. In the final, she will face Nanami IRIE, Yuki’s younger sister. Yuhi FUJINAMI, a 2017 world bronze medalist who finished out of the medals this year, successfully defended his freestyle 74kg title with a victory by fall over Ken HOSAKA in the final. Hosaka surprised the defending champion with an early takedown, but Fujinami quickly evened the score. He then clamped a headlock on Hosaka and, while his opponent looked close at one time to escaping the predicament, Fujinami reapplied the pressure and ended the match in 1:44. The other freestyle title at stake went to world university champion Yudai FUJITA, who defeated last year’s runner-up Shingo ARIMOTO, 6-0, in the 61kg final for his first national crown. The day’s Greco golds went to Hiromu KATAGIRI (55kg), Shogo TAKAHASHI (67kg) and Naotsugu SHOJI (77kg). It was the first for Katagiri and Shoji, while Takahashi previously won at 66kg in 2016. Meanwhile, the tournament, also known as the Emperor’s Cup, saw the return of Rio 2018 champion Sara Dosho in her first competition since suffering a shoulder injury at the Women’s World Cup in March. Dosho, who underwent surgery and had her shoulder heavily taped, won both of her matches on the day in the women’s 68kg class, which has just five entries and is using a round-robin format. Dosho beat Umi FUKUSHIMA, 6-1, and Chiaki SEKI, 2-1, and will finish up the competition Sunday by facing fellow Rio Olympian Rio WATARI in her final match, which will likely decide the gold medal. Watari also won twice. Hiroe MINAGAWA, who won a second straight world bronze in Budapest, maintained her dominance of the women’s heaviest weight class by beating Yasuha MATSUYUKI, 3-0, in what was essentially the 76kg gold-medal match. Minagawa’s victory gave her a 4-0 record in the five-women round-robin group for her third straight national title and fifth overall. Matsuyuki, a world junior bronze medalist, finished as runner-up at 3-1. Takuto OTOGURO, the reigning world champion, will wrestle Daichi TAKATANI for the 65kg Emperor's Cup title. Japan’s lone reigning male world champion, Takuto OTOGURO, advanced to the freestyle 65kg final with a solid 8-3 victory in the semifinals over world U23 champion Rei HIGUCHI, the Rio 2016 silver medalist at 57kg. 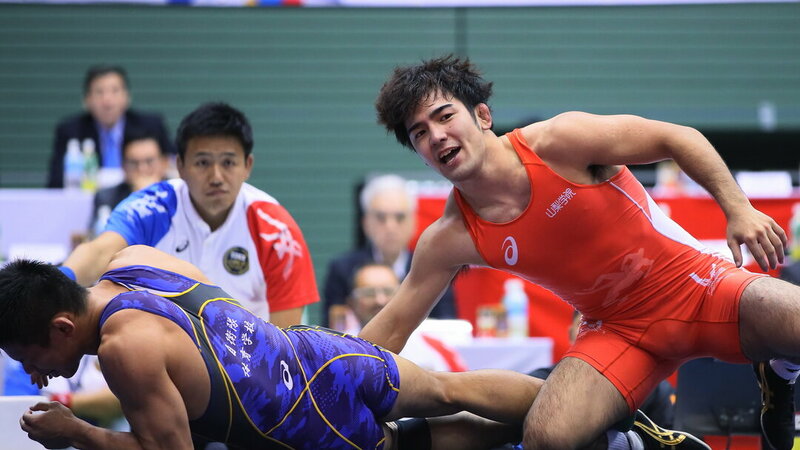 Standing in OTOGURO’s path to a first national title is defending champion Daichi TAKATANI, who lost to Otoguro in a playoff last July for the place on Japan’s team to Budapest and will be looking for revenge. Sunday will also see the latest installment of the Great Greco Rivalry at 60kg between Rio 2016 silver medalist Shinobu OTA and Paris 2017 world champion Kenichiro FUMITA, who have split their last eight matches dating back to 2014. Ota advanced to the final with a pair of technical fall victories, while Fumita scored a technical fall, then came out on top of a wild bout with high schooler Kyotaro SOGABE, emerging as a 13-8 winner when the dust cleared. TOKYO---Adding another chapter to her bulging legend, Kaori ICHO pulled off a dramatic last-second victory over the new titan on the block, and moved a step closer to gaining a shot at winning a historic fifth Olympic gold medal in her home country. Icho scored a takedown with 10 seconds left to clinch a 3-2 victory over fellow Rio 2016 Olympic champion Risako KAWAI in a nationally televised women’s 57kg final that brought a close to the All-Japan Championships in Tokyo. Icho’s stunning victory came a day after Kawai, this year’s world champion at 59kg, edged the four-time Olympic champion 2-1 in a preliminary round-robin group match, handing Icho her first loss to a Japanese opponent since 2001. The 34-year-old Icho won her first national title since 2015 and 13th overall dating back to 2002, despite spending more than two years away from the mat after winning the gold in Rio, which made her the first woman in Olympic history to win four straight titles in a single event. She returned to competition in September as a prelude for the All-Japan Championships, also referred to as the Emperor’s Cup and which was serving as the first stage in the qualifying process for the Tokyo 2020 Olympics. It is for that reason that Kawai and many other top wrestlers have shifted to Olympic weight classes, which put her and Icho on a well-hyped collision course. Icho had beaten Kawai in three previous encounters spanning 2013 and 2014, but she found a far more formidable and mature foe facing her across the mat at Komazawa Gym. Their first match on Saturday featured little action, and Kawai came out on top by being awarded two activity-clock points to Icho’s one. Sunday’s match was a slightly more open affair. Kawai took the lead, although a rule quirk left her with less points than she should have earned. With Icho on the activity clock and it about to expire, Kawai grabbed a single leg and had Icho perched on one foot, but could only managed to force Icho out for a point. Had she waited another three seconds for the activity clock to expire, she would have gotten a point each for the passivity and the step-out. She doubled the lead to 2-0 with an activity-clock point midway through the second period, before she was put on the clock and Icho gained a point with :26 remaining. It was then Icho made her move and snatched victory from the jaws of defeat. A quick snapdown and shuffle to the left left Kawai’s right leg open, and Icho latched onto it. When Kawai attempted a switch, Icho pressed ahead and stepped over to gain control and the crucial two points with just :10 left on the clock. While Kawai was visibly shaken by the stunning loss, her dream of a second straight Olympic gold is not over. She will get another shot at Icho at the All-Japan Invitational Championships (Meiji Cup) in June, where a victory would force a playoff with Icho for the spot on Japan’s team to the 2019 world championships. A medal at Astana 2019---a world gold for Icho would be her 11th and first since 2015--- would mean an automatic place on the Japan squad at the Tokyo Olympics, which is why this year’s Emperor’s Cup had taken on such importance. Icho said she is considering her plans prior to Meiji Cup, which will likely mean an overseas trip for training and/or competition. She is also mulling the Asian Championships in Xian in April, she said. Meanwhile, fellow Rio 2016 champion Sara DOSHO, returning from shoulder surgery necessitated from an injury at the Women’s World Cup in March, was less than her brutally dominating self, but still managed to capture the women’s 68kg gold for her eighth straight national title. With just five entries, the weight class had a round-robin format, and Dosho clinched the gold in her final match with a 2-1 victory over Rio WATARI, who had an inspirational return last year from life-threatening lymphoma. Dosho won all four of her matches by decisions, and in the finale against Watari, all points came with the opponent on the activity clock. Still, it’s a step in the right direction for Dosho, who won a world title in 2017. “I wasn’t concerned about the details of my match, I was thinking only to go for the win,” Dosho said. In the women’s 53kg class, Mayu MUKAIDA, who dropped down from 55kg, didn’t have to contend with fellow Budapest 2018 world champion Haruna OKUNO, but she had to sweat out some anxious moments at the end of her 8-6 victory over Nanami IRIE. Mukaida scored with a takedown and ankle roll for an 8-2 lead early in the second period, only to see Irie fight back with a pair of slick takedowns. Mukaida then spent the final 20 seconds clinging desperately onto a single leg to clinch her third straight national title. Mukaida has appeared to learn her lesson from the Paris 2017 final, where she suffered a devastating last-second loss to Vanesa KALADZINSKAYA (BEL) that cost her the 53kg gold. The other women’s title at stake on the final day of the four-day tournament at Komazawa Gym went to Yuki IRIE, who successfully defended her title at 50kg with a solid 6-0 victory over Kika KAGATA. Irie defeated Rio 2016 gold medalist Eri TOSAKA in the semifinals, while her other main competition, Budapest 2018 champion Yui SUSAKI, had withdrawn after not fully recovering from a dislocated elbow suffered last month. “I think I was able to put out [on the mat] what I acquired in practice,” said Irie, who expressed confidence of winning out among the trio at the Meiji Cup for the ticket to Astana. Japan’s newest star among its male contingent lived up his billing, but anyone who blinked while Takuto OTOGURO was on the mat might have missed his victory in the freestyle 65kg final over Daichi TAKATANI. Otoguro, who became the youngest-ever male Japanese world champion when won the gold in Budapest at 19 years 10 months, needed just 33 seconds to finish off a 10-0 technical fall over Takatani, topping off a double-leg takedown with four rapid-fire ankle rolls in succession. In addition to winning his first senior national title, Otoguro also walked off with the prestigious Emperor’s Cup as the outstanding wrestler of the year. He swept through the competition despite falling behind in his preparation due to an injury that kept him out of the national collegiate championships in November. There was another tale of redemption when Paris 2017 world champion Kenichiro FUMITA regained the Greco 60kg title that he lost last year to long-time rival and Rio 2016 silver medalist Shinobu OTA. Fumita, ahead 2-1 (all passivity points) with a minute to go, countered an Ota spinning arm throw attempt, sending his opponent sprawling onto his back for a 4-point move. An unsuccessful challenge made the final score 7-1. After Ota rallied to defeat Fumita in last year’s final, he earned the place on Japan’s team to Budapest when Fumita suffered a left knee injury in May and had to pull out of the Meiji Cup. Fumita, who considered quitting, returned to practice in mid-August, dead set on avenging the loss and making the Tokyo 2020 team. “I lost in December, then just before the tournament that I had to win in June, I got injured. I was so depressed I was ready to throw it all away. But my dreams of a gold medal at Tokyo 2020 have never wavered. Fumita now holds a 5-4 advantage over Ota in career meetings dating back to 2014. Ota might find some consolation in the fact that the two---they are both Nippon Sport Science University alumni and train together---have now alternated victories in seven straight matches. 3rdPlace: Rinya NAKAMURA df. Rei HIGUCHI by DEF.